The web is a tool, not a toy. One of the sentiments I hear from higher-ups on university campuses is that they see the web as this “thing” they must “have” like the latest electronic gizmo. It’s a sentiment I heard in the late 1990s quite a bit from people — that having a website made you Cooler Than Everyone Else. The frightening thing, of course, is that people are still saying that in 2010. It doesn’t make you cooler than anyone else to have one; it’s de rigueur now, so NOT having one makes you LESS Cooler Than Everyone Else. Around 2002 or so, I noticed a change in what they were saying. They talked now about putting information on the web, filling their sites with a mishmash of information. I dubbed this the “web as bulletin board” approach. This was an improvement over the “web as toy” attitude, but there was no strategy involved, and often you ended up with university home pages that were slumgullions of random chunks of information that had no purpose other than to, well, make you look Cooler Than Everyone Else. Here’s a big box about a research grant we got! Here’s a huge thing on some random academic center whose professor demanded we put it on the front page. Oh, you want to find out about our academic programs? Click on this itty-bitty link down in the bottom right. 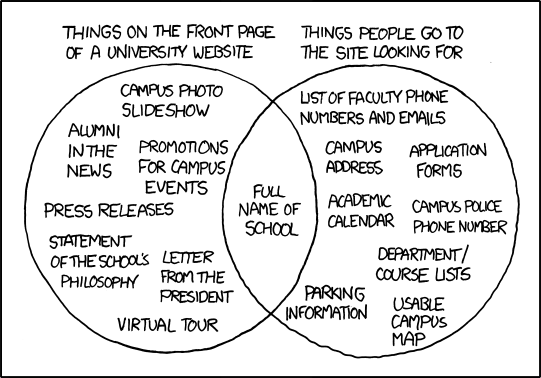 University websites, for the most part, have been a combination of these two things ever since then. Take the now-famous Brown University website, filled with its sliding boxes. Perhaps, from an information architecture standpoint, it’s pretty good (and I think it probably is), but what did everyone talk about? The sliding boxes. This is the Web As Toy, and I personally think it distracts more than enlightens. I don’t think the web is a Toy, and I don’t think it’s a Bulletin Board. I think it’s a tool. It’s a device for getting needed information to the users looking for it. An example: Someone at our undergraduate advising office told me a story a couple of years ago. For a long time, the advisers were constantly going through burnout due to the endless crush of students begging them for help. They decided to do something radical: They rounded up all the frequently asked questions of students — everything from what classes to take to how to declare a major — and put a list of answers on their website. Students were then advised to check the website first to see if the information they needed was already there. Something strange happened in the Advising Center. The students kept coming, but the questions were now harder, things that required time and effort to solve. The advisers, though, found they now had time to do the legwork to solve the hard questions and take the time to help walk students through crises, because they weren’t spending the day on the phone answering the questions the website answered. Students were happier, and the burnout started to fade as the advisers saw what their work meant to these crisis students. To me, that’s using the web as a tool — they identified their audience, identified their questions, answered them, then made themselves more available to deal with the stuff the web didn’t or couldn’t answer. It’s not just the “user-centered design” we wave around like the new banner we must rally around, but it’s also a user-centered organization that uses the web to help make their users’ lives easier. Now, there is one issue with this — what information needs to be in front of the audience. Audiences want to find faculty phone numbers. Audiences also want to find out about your school. Both pieces of information need to be available to them. I am not opposed to the home page as marketing tool. Used correctly, it can be a great device for promoting the institution. But it must come with findability. The information the people are there to look for needs to be obvious. It needs to be findable. Think of it this way — retail stores fill the fronts of stores with aspirational products as well as cheap, high margin tchotchkes. My local Target is loaded with items they’re promoting that I’m not looking for, all with the idea that perhaps I’ll think hey, this is only $1, or hey, I really do need a 5 burner gas grill with sear burner and at a low price to go with the socks and underwear I actually was here to buy. But imagine if Target was only about all this stuff they were trying to promote. Imagine if it was such that you couldn’t actually find the socks and underwear for all the big displays of grills and the videos of people using electric toothbrushes and the aisles and aisles of cheap junk. What would happen? They’d stop selling socks and underwear and everything else people came to find because people would go to Fred Meyer or Wal-Mart where the socks and underwear were findable. And that, to me, is the truth of the XKCD cartoon. A university website is a tool for finding answers. If along the way you find out something new about the institution you didn’t know before, that’s gravy. But if your audience is prospective students, and they just want to know if you offer their degree and how to apply, and you’re shoving videos and mission statements in their face rather than giving them a route to the application form they want to fill out, you will lose. Noel-Levitz’ recently released E-Expectations survey found 1 in 4 prospective undergraduates took a school off their potential applicant list because of a poor experience with that school’s website. We can say all we want about how nice multimedia presentations and marketing materials help draw students in, but if you don’t give the students what they want, they will leave. The web is a tool. It is not a toy. Content may be king, but the user is God. And they demand — and deserve — usability and findability. Let content strategy and user-centered design lead the way, not the hither and thither of provosts and presidents and professors and their pontifications. Some great comments here. We also shared the image around our office; and then a designer added a big red section around things people go to the site looking for leading to Search Box on the front page (you have to see it). It seems that the Search Box is where our users go most on our university home page. Which, of course, tells me we’re not meeting their needs in our architecture. In my testing, I’m finding students are often at a loss as to where to find things that are so obvious to us. And when you pass this along to the powers controlling sites, you hear “but that’s all covered in xyz.” Problem is, students (a) don’t know about xyz or (b) hate xyz’s interface and won’t use it. Thanks for the reminder that we need to go beyond pretty and sales to using the Web to help users DO something! Nice post, Dylan. I love the last paragraph– all of it. I only hope that all of the folks who are circulating this cartoon get the fact that it’s not about the actual words in the circles, but knowing who your audiences are and what they need. I’ve done a lot of research with high school students seeking a traditional 4 year liberal arts education and for them “campus photos” ranks pretty high on the list of home page content (after academics and costs, of course. Just one example of how this chart can’t be used as a literal roadmap for designing campus home pages. I’d add to to the need for “usability and findability” what I think is the next step, utility. Once they find what they are looking for, is it actually useful? Again, thanks for your thoughts on this.